As we carve through the twisting mountain roads of the Pyrenees, a simple single-cylinder engine thumping away beneath me, I cast my mind back 20 years and a day. The way the landscape is starting to color with the advances of autumn, the way the crisp early morning air adds just enough bite to be fresh, but not painful, and the smooth empty road ahead blends the two experiences as if they were one and completely connects me to the motorcycle beneath me. Andorra, France, Spain... how many countries can you hit on one tank of gas? Photo by Markus Jahn. In 1997, I was descending the Carpathian Mountains of Romania on a Kawasaki KLR650. Today, I’m dropping out of Andorra, through a corner of France and back into northern Spain on the new BMW G 310 GS and my soul is on fire. It’s on fire for the friends I’m traveling with, the landscape around me, but more importantly for what this new motorcycle from BMW represents. With a 313 cc fuel-injected, liquid-cooled engine that will probably give around 50 mpg, and a price tag that will start with a 5 (BMW hasn't yet announced the U.S. MSRP or availability), the G 310 GS represents a worthy adventure travel machine that young people, or new riders, will not only be able to afford, but will be totally comfortable riding. And, one that will still be able to take on any challenge they choose to embark upon in this world. It’s been over nine months now since Common Tread editor Lance Oliver and I rode the new BMW G 310 R in Los Angeles, and in his article he discusses much of the philosophy of the new bike, and this BMW G 310 GS, which hadn’t been released at that point. Cruising through the technical specifications of his story, it’s clear there are no changes to engine layout or performance and both bikes share many common components. Where the biggest difference is clearly found is the styling of the “baby” GS, which has been made to completely connect to the rest of BMW’s off-road family. A task it does with aplomb. The BMW G 310 GS is styled to match the look of the popular R 1200 GS and it does that quite well. Photo by Markus Jahn. The riding position is roomy when you're seated and riding on the pavement. For off-road riding, a higher handlebar would make standing more comfortable. Photo by Markus Jahn. This creates a perfect lead in for me to compliment the handling, as no matter how hard we rode, I couldn’t upset the chassis. Consensus of opinion from two fellow journalists and myself — with more than 60 years of combined road test experience among us — was that not many bikes could have been ridden faster on these roads. Sure, a bigger bike would have had more power and better brakes, but the extra weight is its own impediment. Riding hard and fast on the 375-pound BMW G 310 GS required very little effort, compared to a bigger machine. 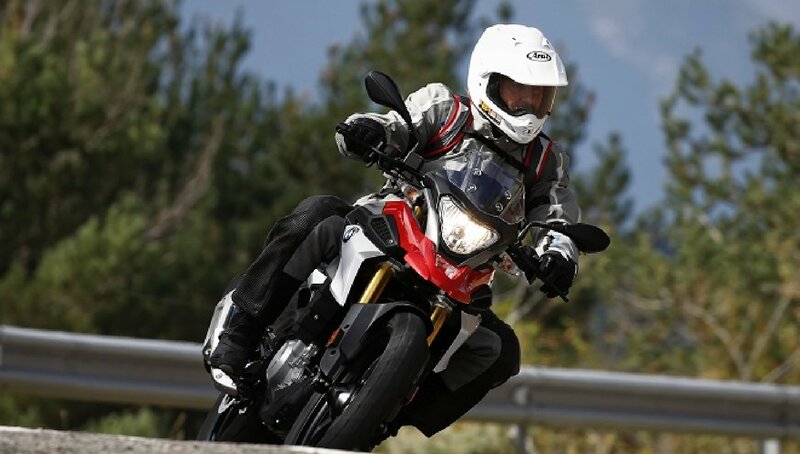 The BMW G 310 GS allows the rider to attack the curves without dragging any hard parts. Photo by Markus Jahn. Because of its off-road intentions, the new G 310 GS gets an additional 41 millimeters of suspension travel front and rear over the "R" and this is quickly apparent when you first climb on board. There is a larger 19-inch front wheel up front, with the same 17-inch wheel out back, and the changes contribute to a 1.9-inch longer wheelbase than the standard G 310 R. With the wider handlebar, the steering response is still feather light and changes of directions are done telepathically, with little body English needed. Unfortunately, we didn't get much time off pavement on the GS. 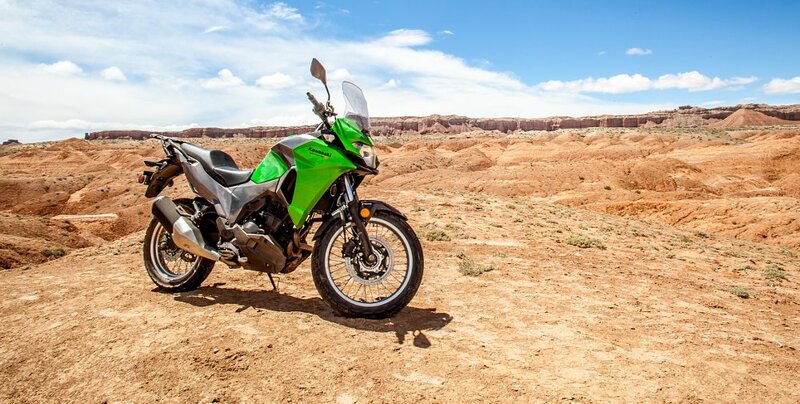 The additional suspension travel and light weight help off-road, but this is still a motorcycle better suited to dirt roads than truly technical terrain. Also, the riding position that I enjoyed on the road was less comfortable when I was standing while riding off-road. If you're my size and going to be doing much riding while standing up, a higher handlebar would be a good idea. When you're between a rock and a dropoff, and the surface is less than perfectly smooth, the lighter weight of the smallest BMW adventure bike is an asset many riders will appreciate. Photo by Markus Jahn. One potential downside to the additional travel of the inverted front fork is dive under braking, and while I initially was a tad concerned, it was never a factor during our ride. Sure, you can’t slam on the single front disc brake on corner entry, but with judicious use of the front and rear brakes together it’s possible to be very aggressive and keep the chassis planted for a fast corner and aggressive exit. We practiced this about seven thousand times on the amazing Spanish roads, so we had a few chances to get it right. Another small change from the roadster is the ability to turn the Anti Lock Brakes (ABS) off when you hit the dirt. As with its bigger brothers, before you ride just turn on the ignition, hold the button for four seconds till it stops blinking and ABS is off. Turn the ignition off and on again, and the system defaults to ABS on as a safety feature. The same reverse (exhaust out the back) 313 cc single that was debuted in the G 310 R also powers the GS. Photo by Markus Jahn. The view in the cockpit is noticeably sparse for someone fed on a diet of larger modern motorcycles with more technology than the early space shuttle, but it conveys the information you need. Speed, engine revs, gear position, fuel level and time. The fit and finish of all the parts is excellent, the mirrors do a great job of showing what’s behind without too much of your elbows, and the small fairing keeps a fair amount of wind off your chest at speed. What wasn’t so perfect was the gearbox, which was less than precise and a tad notchy. Something I don’t remember on the standard G 310 R. Lance had a few problems finding neutral in L.A. on the standard R, and thought maybe with the bike only having 300 miles on it might improve with time. I’m thinking that might be the same for my GS, as no one else in my group complained. It’s not really another complaint, but I’m not a huge fan of the non-adjustable brake and clutch levers. They feel too far away from the grips for me, and I don’t have small hands. Thankfully, BMW offers adjustable levers as accessory items and they would be the first things I would change. The rear rack is big enough that you can strap your camping gear to it. BMW also has accessory top boxes that will go right on. Photo by Markus Jahn. As with all BMW motorcycles, there is an abundance of other factory accessories already available to custom tailor your G 310 GS to your personal tastes. I already like the big, functional back rack for strapping camping gear or luggage, and 29- and 30-liter top cases are available, if you prefer something lockable. Tank bags, heated grips, 12-volt sockets, low and high seats and a center stand are all nice, practical items for the new world traveler. There is also a holder for BMW’s navigation system, and of course a Nav 5 ready to slot into it. For me, though, I think I prefer the way it was touring Europe in 1997 with a good old-fashioned map, which often caused me to stop and check directions. It’s a simpler pace than setting off to conquer the world on a massive, $20,000 adventure bike, and it's the kind of riding I think the new single-cylinder BMW G 310 GS is all about.